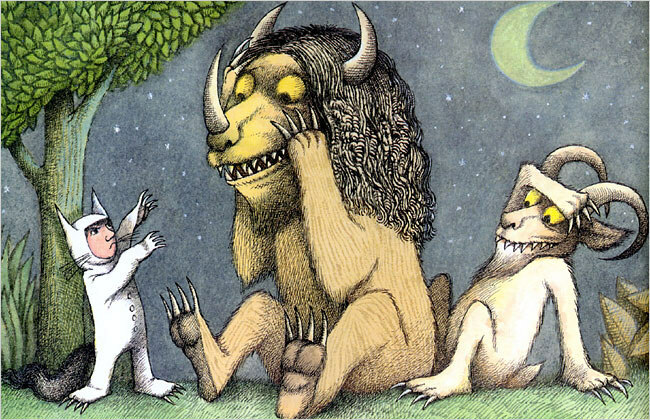 Image from Where the Wild Things Are by illustrator Maurice Sendak. As a child, monsters are very real. In the twilight years between childhood and adolescence, their power shrinks into being imaginary creatures. As we become adolescents and then, finally adults, monsters are just storybook characters and distant memories of sweaty nightmares. But as adults, monsters exist too. We just don’t recognise them. Instead, we tell ourselves they’re real. Even as they threaten us and cause sleepless nights and disappointing backtracks, we believe that they’re real. Monsters of the mind can feel very real. In the grips of fear, our mind is highly skilled at fleshing out the details. At 3am, we can be very articulate detailing all the ways in which we fall down in business (and life). These beliefs appear to be the Truth (capital T). But much like the monsters in fairytales, these start off unassuming and harmless. Fairytales don’t open with the monster because no child would read it. First, the scene is set of happy children with loving families, before some turn is taken and the monsters appear. Similarly, our beliefs start off unassuming and harmless before, over time, they turn on us. Gone unchecked, negative beliefs kill our confidence which, in turn, stalls our business progress and profitability. Perhaps most importantly, negative beliefs kill our enjoyment and satisfaction of being in business. Which is a crying shame. There are easier ways to make a living than being self-employed, so if you’re not deriving joy and satisfaction from it, it’s well past time you excravated these monsters from your mind. If following a particular negative belief to its logical conclusion means you are stuck doing something that you know, deep down, you’re dissatisfied with, then it’s an unhelpful belief. If you’re not marketing because you think you’re bad at it, you reach new people very slowly, your business doesn’t grow, and you putting your livelihood at risk. If you believe that you can’t make any more money in your particular industry, you won’t explore other options to increase profits and will keep on keeping on, making the same amount of money. If you feel you should just be happy and satisfied even though you’re not, you will be stuck in a limbo of frustration, wanting more while trying to supress this desire. If you go seeking assurance for a negative belief you will find it. And if you go seeking evidence of its opposite, you’ll find that too. You can find people who will sing your praises from the rooftops, and you will find people who were unhappy with your service. You can find people in your industry making 10 times what you’re making, and you can find people in your industry who are barely keeping a roof over their heads. By following a belief to its logical conclusion, you’re able to decide whether it’s helpful or unhelpful. Cultivating a constructive frame of mind is otherwise known as a “can do attitude”. Rather than fuelling negative beliefs that stop progress, instead focus on what you’re able to do. You can learn how to get better at marketing. You can practice writing. You can initiate more sales conversations. You can actively practice some skill in business that you feel uncomfortable with or unconfident about. The starting place for making change is to appreciate that you don’t want to stay where you are. For any real change to occur, it needs to come from the realisation that your current situation is not longer tolerable and the pain of change is less than your desire for something different. Every change of season, every new years, we see excited people making plans for real, dramatic change which, predictably, slide back into old habits once the going gets tough. Real change is hard. Learning anything new requires you to first admit you might not know everything. When you’re taking big bold courageous action, like pitching yourself to an event organiser, writing a big quote or giving a speech, it’s suppose to feel scary. But scary and exciting are close cousins. That doesn’t mean you should stop. The best work of your life will likely be the hardest because you’ll care more about it. If you want more from your business, you need to seek help. All the best athletes and business people are continually seeking help to save them time and heartache, and help them identify opportunities and blind spots. While doing it yourself is important when you first start your business, it will cripple your progress after a while. Break the cycle of negative thoughts by seeking techniques and tactics to halt these in their tracks and set up the structures in your business so that progress happens regardless. Especially if a negative belief is caught up with a long-held sense of identity (such as experiences in childhood where you were told you weren’t good at something), getting help is crucial. Change is part of life. We need to get better at change because it’s the only constant. Knowing that change isn’t easy and it’s easier to stay where you are, you need to ask yourself honestly, how much do you really, deep down want your business to progress? Enough to take a leap of faith and trust that you’ll figure it out even though you can’t predict the future? Enough to feel uncomfortable, uncertain and unconfident while you learn and try new things? Enough to deal with the monkey mind that kicks up a fuss when you’re taking big bold moves? Enough to ask for help? Hustle & Heart starts soon! Join us now.